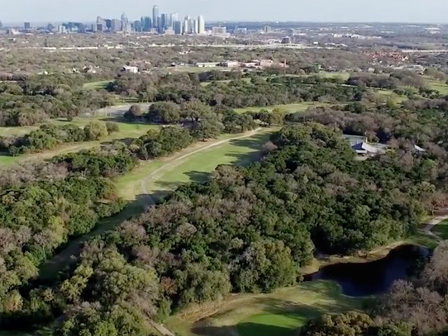 The heavily-wooded 141-acre Lions Municipal Golf Course, known as “Muny,” is located just two miles west of the Texas State Capitol in Austin. It was designed in 1924 and remains in its original use today as a golf course. The course was laid out on land owned by the University of Texas and has been leased to the City of Austin since 1936. 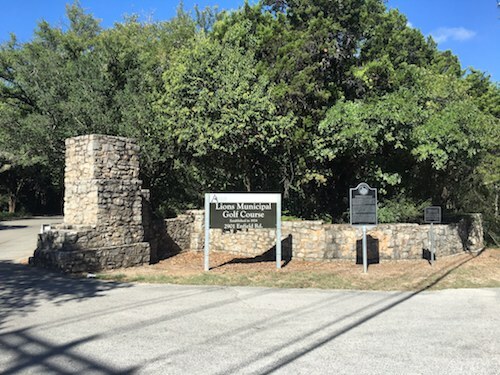 In 2016, Muny was added to the National Register of Historic Places as a historic district that includes nine contributing buildings, structures and objects. In late 1950 – following the Supreme Court’s decision in Sweatt v. Painter but well before Brown v. Board of Education – Muny quietly became the first desegregated municipal golf course in the South (defined as the states of the old Confederacy). African Americans routinely played at Muny thereafter. In 1951 and again in July 1953, Joe Louis (former heavyweight-boxing champion and, at that time, golf’s ambassador to black America) played at Muny. The desegregation of Muny and then other local facilities during 1950-54 occurred without conflict and with minimal public debate, in contrast to the hostile resistance of many communities in the South … The desegregation of Muny reflects progressive changes in the Jim Crow south before the advent of the post-Brown Civil Rights Movement. Upon expiration of the current lease in 2019, The University of Texas has proposed the redevelopment of Muny for mixed commercial and residential uses, which would destroy the integrity of Muny’s historic resources and cultural landscape and result in the closure of the nearly century-old golf course. It would also destroy the valuable and much needed natural open space that Muny provides in a city that is becoming increasingly congested and dense with commercial and residential development. Because of these threats, Muny was listed by the National Trust for Historic Place’s 11 Most Endangered Places list in 2016. Extensive media coverage and “Save Muny” advocacy efforts gained the attention of the Texas legislature in 2017, including Senate passage of Senate Bill 822 that would have transferred ownership of the golf course to the Texas Parks and Wildlife Department. Preservation Texas supported SB 822. Although the bill received a public hearing at the committee level in the Texas House of Representatives, no action was taken and the legislation was not enacted. Short of a state legislative solution in 2019, a long-term partnership between The University of Texas, the City of Austin and other stakeholders will be required to protect the integrity of Muny and its Civil Rights story for Austin, for Texas and for the nation. For more information about the history of Muny and ongoing advocacy efforts, visit Save Muny. Interested in other endangered Civil Rights-era sites in Texas? See 1924 Democratic Primary Polling Place (2017) in El Paso and the Woolworth Building (2016) in San Antonio.